Photos provided by Barb Heiss, Jerry Armellino, Kevin Slick, Charles Henson, Pat Gonzalez, and others - thank you! 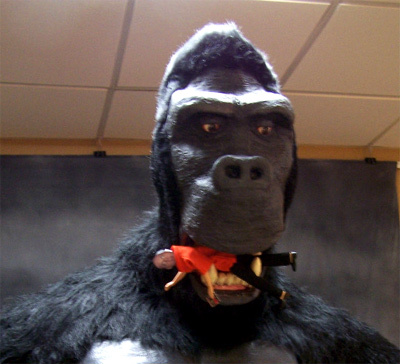 King Kong eats Monster Bash programming director Ron Adams. 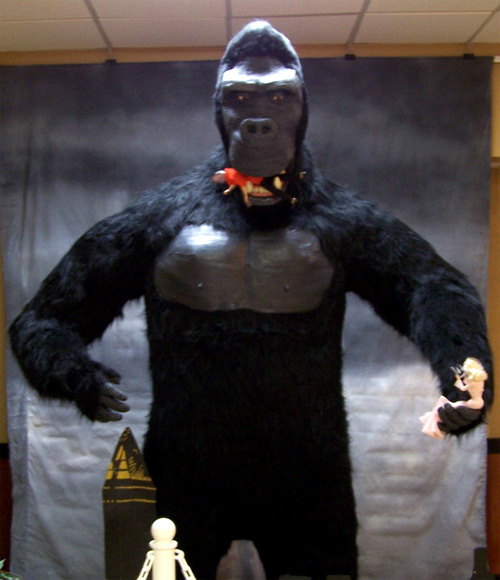 Kong was a 9 foot scultpture by the Aremellino family and was in the hotel lobby! At the Monster Bash registration desk - it's staffers Jerry Armellino, Kristen Armellino, and Barb Heiss. 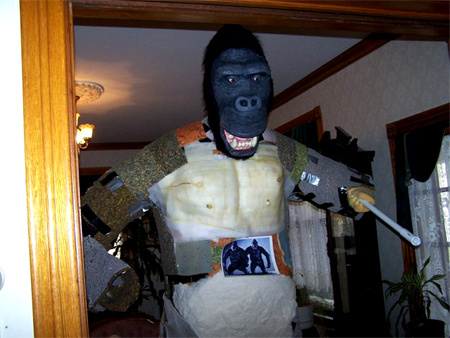 Pre-Bash - The making of Kong. Initial groundwork by artist Carrie Armellino. 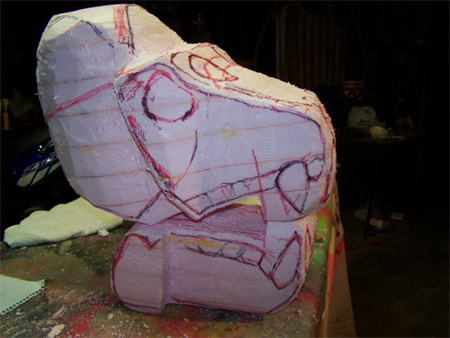 Making a monster - it's Carrie Armellino. Padding out Kong in the Armellino parlor. In all his gory glory in the Days Inn Conference Center lobby. The 8th Wonder of the Bash! 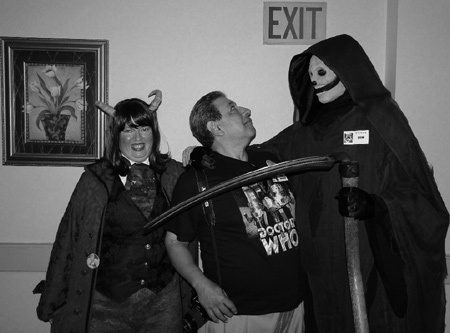 Massachusetts TV horror host Penny Dreadful with Jerry Armellino. 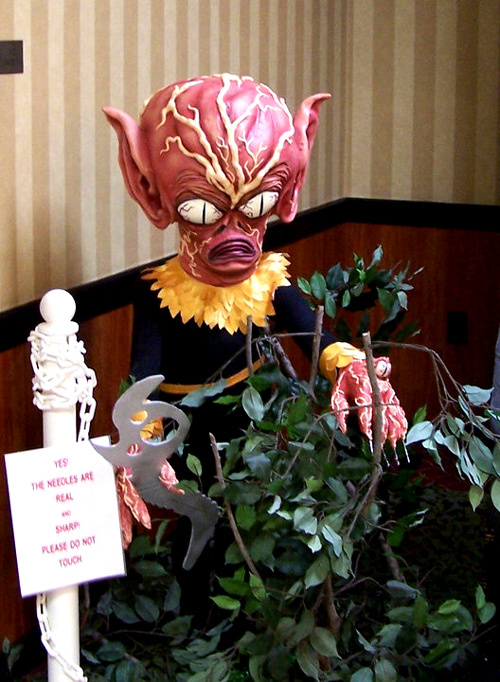 Another life-size creation by the Armellino family that beamed down to the Monster Bash lobby - a saucerman! 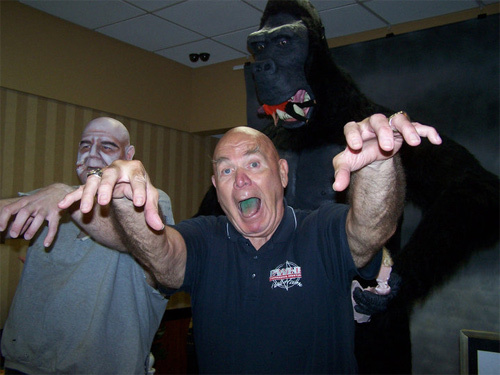 Three BIG guys at MONSTER BASH: Comedian Don Reese as Tor Johnson, George "The Animal" Steele, and King Kong. 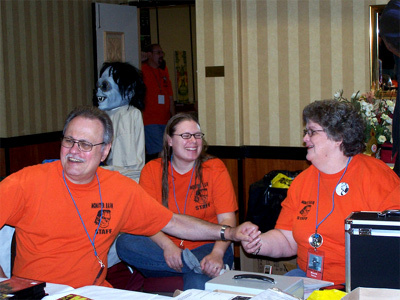 The ever-smiling Ursula at Monster Bash registration, Ron surveys from the monitor to the right! The true die-hards at Monster Bash. After the show is over and the dealer room is a sad sight of empty tables...the people that don't want it to end...beginning camping out for next year! 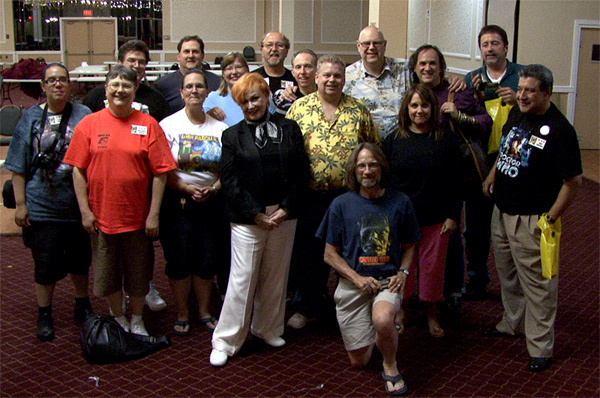 WAR OF THE WORLDS actress Ann Robinson is front and center with some of the nicest attendees on Planet Bash. 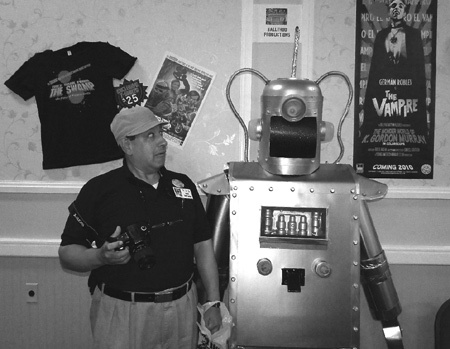 John Santiago meets the Mexican robot at the Ballyhoo Productions table. 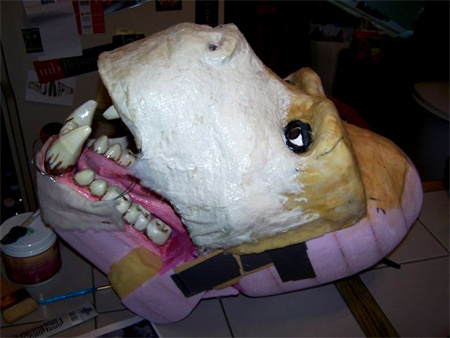 John Santiago discovers The Patent Creatures at Monster Bash and has a face-to-face with Grim! George "The Animal" Steele takes questions from the audience. Moderated by Bash staffer and WWF fan - Leonard Hayhurst. 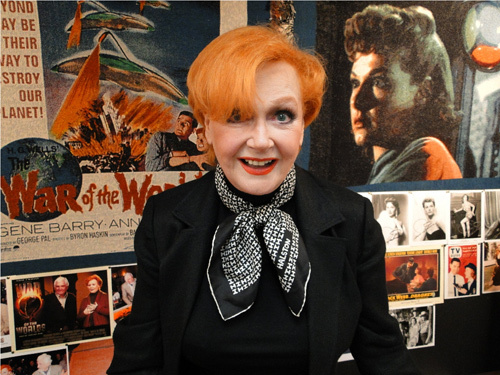 Ann Robinson, star of THE WAR OF THE WORLDS (1953) smiles for the camera. 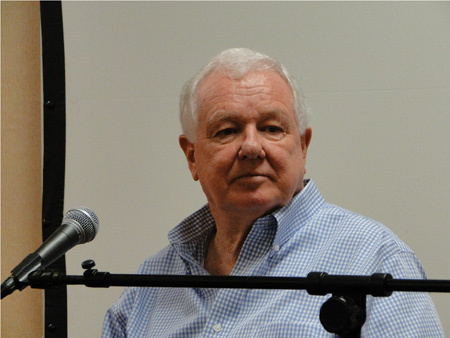 Jimmy Hunt listens to a fan's question about his movie INVADERS FROM MARS.